Ulstein Verft AS has signed a contract for the building of a DP2 Construction Support Vessel (CSV) for the Netherlands based Acta Marine B.V. The vessel is primarily aimed at the offshore wind market and carries the new SX195 design from Ulstein Design & Solutions AS. “We are expanding our services and fleet for offshore wind and chose Ulstein for our new construction support vessel. The dedicated SX195 design with the X-STERN, an integrated walk-to-work gangway system and 3D crane, and its accommodation, represents a next step in responding to the market needs,” says Rob Boer, managing director in Acta Marine. In-field flexibility, winter workability, safe transfer of people and cargo, optimised on-board logistics, high productivity and high comfort for charterers’ crews are of eminent value. “This vessel will be the next level in the market and very well suited to operate in the offshore, and specifically the renewable, market. Furthermore, Ulstein Verft is renowned for its quality and on-time deliveries, and a vital part of the ship construction is carried out in a roofed and controlled environment,” states Boer. 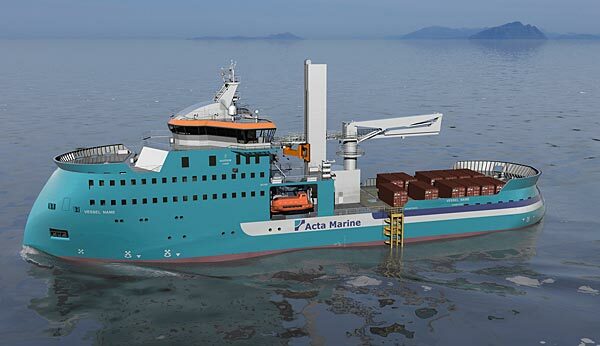 “We are very pleased that Acta Marine has chosen Ulstein for this project. We are looking forward to the cooperation and to deliver a new vessel to the growing renewables industry,” comments CEO Gunvor Ulstein at Ulstein Group. The CSV vessel is measuring 93.4 metres in length and is 18 metres wide, and can accommodate up to 120 people in 80 cabins. It will be equipped with an SMST provided Dynamic Motion Compensated Gangway system, mounted on an integrated tower with height adjustment and a personnel/cargo lift. Additionally, the vessel features a 3D-motion compensated crane with 6t lifting capacity. Cargo area is 500 square metres indoors, and 500 square metres outdoors. The vessel shall provide for walk-to-work transfer of personnel and cargo, efficient and safe in significant wave-heights (Hs) up to 3.0 metres. Acta’s new CSV can take on assignments in commissioning and construction in the offshore wind farm installation phase, and perform maintenance tasks on completed wind farms. The vessel is scheduled for delivery early 2018. Besides carrying the X-BOW® hull line design, the vessel is also equipped with the X-STERN®, which increases the flexibility and operability while at the offshore wind farm. The hull shape increases comfort for the crew, with a substantial reduction in slamming, noise and vibrations. “Together with Acta Marine, we have developed a state-of-the-art vessel, and we are ready to build a vessel that will serve the owner well in the offshore wind industry,” says Kristian Sætre, managing director at Ulstein Verft.